Benjamin the son of John Cursly (Cursley) and Anne Parker was baptised Benjamin Cursly (Cursley) in the Parish Church of St. Peter and St. Paul, Kettering, Northants on the 7th February 1762. On the 9th April 1781 he joined the Plymouth Division of the Royal Marines as a private in the 57th Company, his trade was a Cordwainer (shoemaker). He saw service in the West Indies and aboard H.M.S. Carnatic, a Royal Navy Guardship. Benjamin eventually sailed from Portsmouth on board "The Friendship" at 5 am on Sunday 13th May 1787. The Friendship was one of 11 ships that formed the first fleet of convict transports that sailed for Australia via Tenerife, Rio de Janiero and Cape Town arriving in Botany Bay on Saturday 19th January 1788, thence to Port Jackson arriving on the 26th January. He joined the company of Captain James Meredith and sailed on the "Supply" to Norfolk Island, returning to Port Jackson in early 1792. Benjamin and Pheobe's daughter Anne was born in September 1792 their marriage followed at Paramatta on the 31st March 1795. Phoebe Penlarrick was a convict, having received a sentence of 7 years transportation at the Devon Assizes on the 26th July 1790. She was transported on the "Mary Anne" as part of the third fleet arriving in 1791, her crime was to steal clothing to the value of 50/- (shillings) the property of Priscilla Popplestone. In January 1797 their daughter Maria was born. In 1799 Benjamin was granted 200 acres of land in Mulgrave Place. By 1806 Benjamin was farming 50 acres of wheat and pastureland. His stock consisted of three male and three female hogs. Pheobe died at Hawkesbury on the 15th November 1815 age 60. Benjamin re-married, his second wife was Mary Chadderton, a widow who also sailed as a convict aboard the "Mary Anne"
Benjamin died at Wilberforce, New South Wales in June 1845, he is buried with Phoebe in the cemetery of St.Mathews Church, Windsor, N.S.W., and is commemorated on the memorial to Hawkesbury Pioneers in the same town. Mollie Gillen, "The Founders of Australia". David Hawkings, "Bound For Australia". The Northamptonshire County Record Office, Kettering Bishop's Transcripts: 1761, 1762 and 1763. 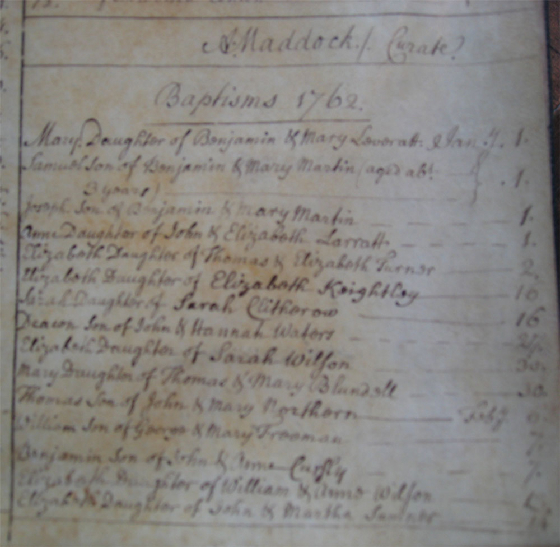 SS Peter and Paul, Kettering, Marriage record John Cusly and Anne Parker 1761. Baptism record Benjamin Cursly 1762. Burial record Anne Cursley 1762. Marriage record John Cusley and Mary Hill 1763. With thanks to descendants of Benjamin Cusley: Maureen Williams, Charles Brennan and John McCosker.